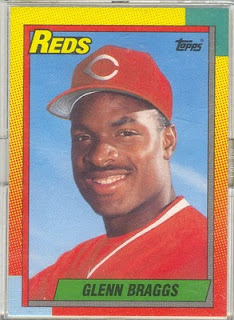 I have theories as to why I consider Glenn Braggs my baseball-playing alter-ego. I have lots of remembrances of that 1990 Reds World Series team. Larkin, Davis, Rijo, the Nasty Boys, Sabo’s goggles, Billy “Pop-Up Heard Round the World” Hatcher. But I always find my favorites in the utility players (hence my love of Miguel Cairo, Willy Mo Pena, Ryan Freel) and the forgotten intangibles that made them such a fun team to root for that summer and beyond. Glenn Braggs, for many reasons, was my favorite Red that year. He had a monstrous physique, a contagious smile, a built-in name suited for the ultimate ’88 emcee, and the propensity to break bats over his knee, or, on occasion, in mid-swing. Braggs was infinitely likeable, a power-outfielder who worked hard to keep that status despite a .257 career average. Maybe he never had the chance, the ABs to prove them wrong. For his 7 seasons in the majors he played a small role for both the Brewers, who first drafted him, and my beloved Reds (to whom he pledges his allegiance). And just like Braggs was an integral cog in the (new) Big Red Machine, his life is full of intangibles that make him even more an intriguing personality. He went on to play for the Yokohoma BayStars until 1997, married Cindy Herron of En Vogue, and continues to work his way into the Cincinnati organization. He probably even kicks it with Charlie Sheen now and then, though as far as I can glean he’s not named in the Mitchell Report for steroid use. A true star of the Bo Jackson Shoebox era. Even his Starting Line-Up is rare. I remember as a kid working for Milwaukees triple A team in Vancouver as batboy and general gopher in 1985 and 1986. Glenn Braggs was such a huge guy with a Mr. Universe physique. I was in awe. I would soft toss him baseballs that he would drill into the makeshift cage behind the bleachers. Its hard to believe this guy never crushed 30 homers in a season. I really thought he would be a superstar. He was such a great guy and very polite. Always treated me with respect. I really appreciated my years there meeting some great people and he was definitely one of the nicest guys i encountered.